Anemoment, a leading developer of compact three-dimensional ultrasonic anemometers for UAVs (unmanned aerial vehicles) and ground control stations (GCS), has partnered with Unmanned Systems Technology (“UST”) to demonstrate their expertise in this field. The ‘Silver’ profile highlights how their robust meteorological instruments deliver unmatched precision and accuracy for a wide range of UAV applications, including environmental monitoring, precision agriculture and wind profiling. The TriSonica Mini is the world’s smallest and lightest 3D ultrasonic anemometer. 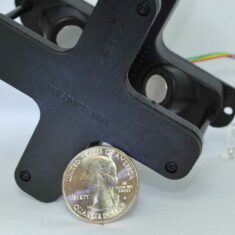 Small enough to fit in the palm of a hand, it weighs just 50 grams and has no moving parts, making it an ideal ultrasonic wind sensor for UAVs and other SWaP (size, weight and power)-conscious systems. The TriSonica Mini provides wind speed, direction and temperature data outputs, as well as measurement of all three air flow dimensions. Accurate measurement is maintained even at tilt angles of up to 15 degrees, making the anemometer ideal for moving platforms such as UAVs and USVs (unmanned surface vessels), as well as fixed locations such as UAV ground control stations (GCS). The TriSonica Mini anemometer outputs an ASCII string via RS-232 that can easily be stored to a text file. Data emulation allows the system to be directly connected to existing off-the-shelf data loggers without costly changes to associated electronics. Data output is factory set to user requirements and includes the emulation of many common types of wind sensors, allowing the TriSonica Mini to be used as a convenient upgrade to older, bulkier devices. The TriSonica Mini is also available as a Tactical Weather Station variant. In addition to the wind data provided by the regular TriSonica Mini, the Tactical Weather Station also provides humidity, pressure, 3D accelerometer, magnetometer and compass data. This in turn allows calculation of accurate dew point, air density, yaw, pitch, and roll figures. 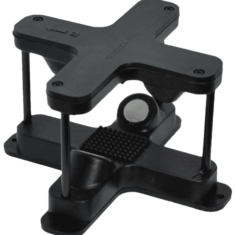 The TriSonica Mini Tactical Weather Station is designed to be incorporated into UAV ground control stations and other space-constrained positions where high-accuracy environmental data is required.